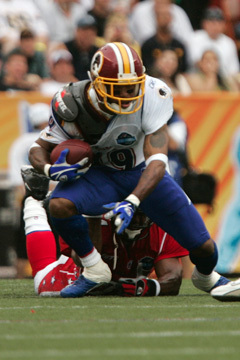 The AFC's Ty Law dragged down the NFC's Santana Moss during the first half of Sunday's Pro Bowl. Once again, the relevance of the Pro Bowl was a topic for national discussion a day after the NFL all-star game, overshadowed only by stories about a washed-up ice skater's groin injury and the gambling habit of a retired hockey star's wife. Pitchers and catchers, get there fast. You can argue whether the image of the Pro Bowl is victim to Post Super Bowl Syndrome or -- especially from a snowed in East Coast -- February in Hawaii Envy. Or both. If we all agree the Pro Bowl is not a game (at least in the oxymoronic sense of a "serious game"), that's a good starting point. An incredible collection of talent? A supreme spectacle? An economic boon for the state of Hawaii? Yes, yes and ye$. When taken in the sense of An Event, not even a halftime show featuring the Backstreet Middle-Aged Men can bring down the Pro Bowl. But a game to be taken seriously? The combined 10 turnovers in the NFC's 23-17 win Sunday answers that with one statistic. Some news does come out of Pro Bowl week, because free agency looms for many superstars. This year Edgerrin James backed off on an earlier statement that he might bolt the Colts, and Shaun Alexander hinted he might fly the Seahawks coop. The 2006 Pro Bowl could have been the last time to see the NFL's top two running backs in Indianapolis and Seattle helmets. And rumors are quashed, like the one that the Broncos are shopping Ashley Lelie to make room for Terrell Owens (with whom Denver has met). If coach Mike Shanahan is to be believed, Radford and Hawaii alumnus Lelie isn't going anywhere except on more fly routes for Jake Plummer. "This is the time of year all kinds of crazy things are said," Shanahan told the Denver Post. Still, one of the biggest questions of the offseason remains where Owens will end up after alienating himself from the Philadelphia Eagles. Owens was rumored to be in the islands over the weekend. And his high-profile agent, Drew Rosenhaus, was spotted on the grounds of the Ihilani Resort, apparently here to play Let's Make A Deal. That's something the state won't have to do for a while, since its contract with the NFL runs through 2009. Gov. Linda Lingle and Honolulu Mayor Mufi Hannemann are both overjoyed to host the NFL's best on an annual basis. "NFL Pro Bowl week provided an outstanding experience for residents, visitors and fans," Lingle said yesterday. "The week-long activities, the sellout game, and the live national broadcast in the middle of winter all translate to significant economic contributions to our economy." She also praised the players' positive interaction with the youth of Hawaii. Hannemann feels a special attachment to the event, since he negotiated keeping it here twice, once as the state's sports tourism czar and then after a request from then-Gov. Ben Cayetano when Orlando made a grab for it in the late 1990s. "The impact of the Pro Bowl is awesome. Every year it's great," Hannemann said. "Everybody seems happier during Pro Bowl Week, restaurateurs, cab drivers, small-business owners. It's just a wonderful event." Jewelry stores in particular must be tickled, with lots of millionaires in town a few days before Valentine's. While it isn't much of a game, the Pro Bowl remains a sweetheart deal for pretty much all concerned in the 50th State.